In recent weeks I have been attempting to make my way through some of the Shepherd Press catalog of books. Many of the titles and some of the authors were unfamiliar to me. Yet it seems that every time I read one of these titles I unearth some new treasure. Books like Polishing God’s Monuments and When Sinners Say “I Do” have blessed me greatly, have stirred my heart and have strengthened my faith. So it was with some expectation that I turned to Everyday Talk by John Younts, another selection from the Shepherd Press catalog. 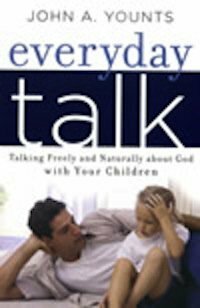 Everyday Talk is, according to the subtitle, a book about “Talking Freely and Naturally about God with Your Children. With my children often asking about God and with my wife and I trusting that God will, in time, lead them to Himself, I was eager to receive guidance on how I can speak to them in spiritually meaningful ways. Reflecting on the book a week or so after finish it, I think I found it most helpful in dealing with the subject of obedience. As the parents of three young children, my wife and I often struggle with this issue. We want our children to obey us and to do so with joy rather than anger or unwillingness. We want to teach them the importance of obedience. We know that we have sometimes done very well with this and at other times have done poorly and are seeking to do better–to be more consistent. Younts teaches that “the goal of your instruction is not only to [for example] have the garbage taken out, but also, primarily, to teach your children the joy of obeying God.” It is pleasant words that promote instruction, and not angry or undignified ones. Looking at the example of God’s patience with the people of Israel, I learned that I need to stay the course, remaining kind and pleasant even while demanding obedience from my children. And when my children do refuse to obey, or refuse to obey willingly and with a joyful heart, my job is “to recognize their sin for what it is and teach them how to deal with it God’s way.” I can only do this when I understand that their sin is primarily an offense against God rather than being against me. I need to help them understand that though they may have sinned against their parents, the greater sin was against God and they must be reconciled to Him. Parents, when you give in to anger, resentment or self-pity at your children’s bad behavior, you make yourself the center of the problem. You are loving yourself first and most. You must love your kids enough to show them the danger of their behavior. They need to see that their first problem is with God, and only secondarily with you. … You must be more concerned for them than for yourself, and you must be concerned most of all for God. By modeling patience, love, self-control–and all the fruit of the Spirit–you teach your children how extraordinary God is. In the book’s opening pages Younts says, “My prayer is that this book will help you learn how God wants you to talk about Him every day.” And later he writes, “the purpose of this book is to help you, parent, to reflect the power of gospel grace in your everyday talk.” While God certainly has a lot of work to do in helping me consistently reflect the power of gospel grace in my everyday talk, this book has already helped me see the importance of considering the words I use and the attitudes I convey through all of life’s moments. Already it has given me new ears to hear my words and my wife’s words to ensure they communicate the fruit of the Spirit and it has given us new ways of considering how we can ensure that our everyday words impact our children for their good and for God’s glory. I’m glad to recommend this book to you! You can purchase it from Westminster Books (and, of course, from Amazon). And since Westminster offers flat rate shipping, why not stock up on all three of the aforementioned Shepherd Press titles. You’re not going to regret buying any of them!